Home by American Idol winner Phillip Phillips, is a fairly advanced song. 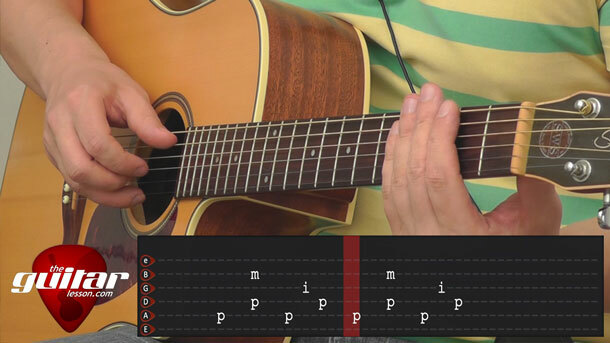 The chords are simple, but the fingerpicking and strumming parts are sort of fast, which makes it a challenge to learn. If you have been playing guitar for a while, I really encourage you to learn this song, your technique will advance by leaps and bounds. In our guitar lesson on Home, we’ll be learning the entire song, including the intro, verse, chorus, and the ooooohhhh ooooooooooooooohhhhhhhh part as well (aka interlude). First off, we’ll learn the picking pattern you’ll use throughout the song. You’ll need to practice it a lot and really program it into your fingers, because you’ll have some fast chord changes, where you just have to keep that picking pattern going, without thinking about it. I’ll show you the pattern in detail. Start out slow as always, and speed up as you feel comfortable. Getting to the speed of the actual song will take a bit of time, depending on the level you are at. If you’re not up to tempo in a day or two, don’t worry. Just keep on practicing, and you will be soon. Once you learn the picking pattern to Home, we’ll start going through the separate sections of the song. The original picking pattern is used on all of the chords of the intro, and most of the verse. The last bit of the verse has 2 walk downs, where the picking pattern will change a bit. This will be challenging as well, so give it time. Practice it slowly, and you’ll get it sooner than later. We will also learn the strumming version of the song. When playing live, Phillip Phillips just strums the entire song, and another guitarist plays the fingerpicking part. This will be a very fast strumming pattern. The key is in the quick up-down-up strums. That inner quick strumming is more like scratching the strings, don’t think of it as strumming. Don’t use wide strumming movements there, focus on just the inner 4 strings. It’s a good idea to practice the strumming pattern not holding down chords at first. All in all, Home is a really cool song, but it’ll take some practice because of the speed. Once you learn it, you’ll know that you’ve truly advanced your playing, and learned a great song in the process. Home by Phillip Phillips was released in 2012. This was Phillip's debut single after winning American Idol that year. He first performed the song on the season's final performance night on May 22, 2012. The song was also included on his debut album, The World from the Side of the Moon, released in November, 2012. The song was written by Drew Pearson and Greg Holden, not Phillips. The song hit the No. 1 spot on 11 separate Billboard charts, including Hot Digital Songs, Hot Digital Tracks, Adult Top 40, and Adult Contemporary. On the Hot 100, it peaked at 6th place. Sorry, but you've reached a premium content area. The download of the Home tablature file is only available to premium members. Sorry, the same goes for the backing track. To download the backing track to Home, please log in and revisit this page.